Not all Nobel Prizes are equal | It's a Miracle! As this years Nobel Laureates collect their prizes, a post in The Great Beyond mentions that winners in future years might actually get less prize money. The Nature blog quotes a story in Reuters which states that the Nobel Foundation has taken a 20% hit in assets due to the global recession. On Twitter, Jason Snyder pointed out that a downsized Nobel was better than a confiscated one, to which I commented that a confiscated one was still better than a stolen one. For those that aren’t up on their Nobel news, Jason was referring to Iranian Nobel Laureate Shirin Ebadi’s charge that officials had seized her award, a charge which Iran subsequently denied. I was talking about Indian Nobel Laureate Rabindranath Tagore’s medal which was stolen in 2004. The police recently decided to close all investigations in that particular theft. Clearly, not all Nobel Prizes are equal. 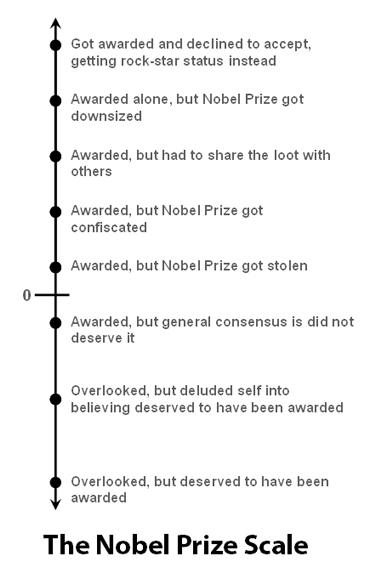 Here, you’ll find my list of how Nobel Prizes stack up on an arbitrary, but scientific-looking scale. For the extra-inquisitive, I’ll add that Jean-Paul Sartre was the first person to decline a Nobel. Mahatma Gandhi, on the other hand was not deemed worthy by the Nobel Committee for the Peace Prize. Of course, Alfred Nobel who started the Nobel Peace Prize, invented dynamite. This entry was posted in because I said so, Q.E.D, scientifiky and almost science by Anirban. Bookmark the permalink.